When setting out to create an email, most marketers spend a bulk of their time selecting the offer and writing the copy. Less effort is spent making sure they deliver that message to the right person. And it's even rarer that they take the time to personalize the email to each individual recipient. This is a shame. A great email is about the combination of great content with the appropriate context. Email is such a valuable channel because it allows you to create an individual message using personalization and segmentation. Think about your social media and blog posts. When you post something, every reader sees the same message. Email, however, references your contact database, which means you can tailor your message in exciting ways. There are so many components of an email that you can use to signal that you are having a 1:1 conversation with a reader. Who the email comes from, what the subject line says, the copy, the call-to-action, the design, can all be tailored and customized. So just because your email went out to 100, 1,000, or even 10,000 people, doesn’t mean it has to read like it did. Below are five ways that personalization and segmentation can improve your email sends, and how to do them in HubSpot. Why segment your send list? Simply put, segmented emails perform better than unsegmented emails. Segmented email sends receive 14% more opens, 63% higher clicks and 8% fewer unsubscribes than unsegmented ones. Segmentation is the simplest, most powerful and most effective way a marketer can improve their emails. The more focused your segment, the more targeted you can make your messaging. Lists, and the contact database that powers your list-building, is what gives context to the experiences that people have with your company. It’s what allows you to organize and communicate with your contacts based on their common needs and priorities. 1. Know what data you have available: The world is your oyster when it comes to building your send lists. With one caveat. You can only segment using the information stored in your contact database. As a HubSpot customer, you should become familiar with the information that HubSpot tracks and stores about your contacts (you can find that here). And if you're sitting there saying, "I wish I knew my contacts (location/industry/favorite dish soap/favorite soap opera)", you can build a custom contact property to track and store that information as well. 2. Determine your strategy: A great segmentation strategy supports your business goals. See this blog post for 20 in-depth examples of segmentation. Beyond those essential lists, things can get really interesting when you begin to combine these core lists. With a strong contact database you can make decisions like “I want to send an email to C-Level executives at software companies with more than 1000 people who have read my most recent blog post ” or "I want to send an email to all of my customers who attended last month's conference who expressed interest in our new product line." 3. Build your lists: Follow these instructions to start building lists in HubSpot. Why use smart content in your email? Smart content, also know as contextual or targeted content, is content that displays differently for different contacts. For example, smart content allows you to create and send one newsletter, but your customers see one thing and your prospects see a different one. Or even the copy of your email written in French for your customers in France and your email in English for others. Pretty cool, right? 1. Determine the goal of your email: First, decide what type of email you are sending and the goal of the send. Is it a product update, a new website launch, a newsletter? Something else? 2. Identify your segments: Once you know the purpose and goal of your email, decide if you would like to change the messaging and content of that email based on any variable. Do you want to use multiple languages because you are an international company? Do you want to change the positioning of a product update based on whether someone is already a lead or a customer? Are you hosting a conference and want to send a different message to first-time vs. repeat attendees? Smart content is a great opportunity to add more context to these types of emails. 3. Build your segments: Once you know which segments you want to build, you should create them in HubSpot. 4. Create your smart rules: Once you've created your segments, you can use them to create a smart rule in your email. This is the mechanism that shows different content to different contacts. 5. Write the content: Once your smart rules are created, you can create the specialized content that you want each group to see. Why personalize the email sender? Who an email is sent from is an important but often overlooked component of a successful email. It's also ripe for personalization and additional context! Think about the emails that you receive. The person who sent you an email is probably one of the main determinants of whether you open it The sender signals whether you should care, and whether you can trust, the message. 1. Consider the type of email you are sending: What information are you sharing? For example, if it's a transactional email confirming a purchase, then the email should come from the company. If you are an international company and have a regional or territory leader, it should come from that person. If it's a quarterly check-in with an account manager, the email should come from that individual. 2. Consider the lifecycle of your contacts: If they are a lead, where are they on their path to purchase? For example, a new lead might not know anyone at your company, so you should use the company name. If they are a customer, what is the nature of their relationship with your company? Consider the price, complexity of purchase, or any existing relationships they may have (sales rep, account manager) cultivated. If your customers have a dedicated account manager, though, the email should probably come from that person. 3. Use a personalization token to personalize the sender in HubSpot: One of the benefits of using HubSpot is that your emails are connected to and reference a contact database. This database allows you to create properties, which means you can associate a contact with a specific sales rep, consultant, or account manager at your business by storing that information on the contact's record. This allows you to send an email appearing as if the email is coming from a specific person as identified in the recipient's contact record. This article will show you exactly how to do that. Why personalize the subject line? In the seminal book How to Win Friends and Influence People, Dale Carnegie quipped, "Remember that a person’s name is to that person the sweetest and most important sound in any language." Apply that perspective to your subject lines, and it's no surprise that "including a name in the subject line boosted open rates by 29.3%." Personalizing a subject line can go beyond the first name, however. Anything from a person's location to the number of times they've been a customer is an opportunity to add context to a subject line. Think about the subject line as the teaser and the hook that entices someone to read your email. People are more interested in things that are contextually relevant to them. So much so that Campaign Monitor reported that emails with personalized subject lines are 26% more likely to be opened. 1. Decide how you want to personalize your subject line: First, you'll need to decide how you plan to integrate personalization. A person's name and location are easy opportunities, but consider using other information like recent purchases or areas of interest to enrich your subject line. A survey request that asks, "How are you enjoying your headphones" might perform better than "How are you enjoying your most recent purchase?" It doesn't have to be big to be effective. 2. Insert the personalization token: Once you've picked which property you want to use, add it to your email by following these instructions. 3. Pick the default property value: It's possible that some contacts in your database will not have a value for the property you've selected. That's why you'll want to select a default value for any property you plan to use for personalizing your emails. This will create fallback text that will display when a contact has no data in that property. So, if you insert a personalization token for First Name but the contact you sent to has no first name on their record, it will show the default value text instead. Instead of your subject line reading "Hey _____," you could set the default property to display it as "Hey there,"
4. Make sure you data is clean: The only thing more awkward than a blank space is personalization that uses the wrong information. This is just a friendly reminder to make sure the information for your contacts is accurate and up-to-date. That's the best way to make sure your personalization efforts are successful. Why use personalization in your email copy? If you've ever received an email that referred to you by name, you've seen a personalized email before. But a successful personalization strategy is about more than simply addressing your recipient by their first name. It’s about creating a contextualized and deeply individual experience for your recipients. Adding a personalization token to your subject line is only the beginning of your ability to personalize your emails. You can add additional tokens throughout the copy of your email as well. In fact, a study by Experian found that personalized emails received 41% higher click rates than emails without any personalization. 1. Decide which personalization tokens you want to use: Just like your subject line, you can use any contact property in your database to personalize the copy of your email. 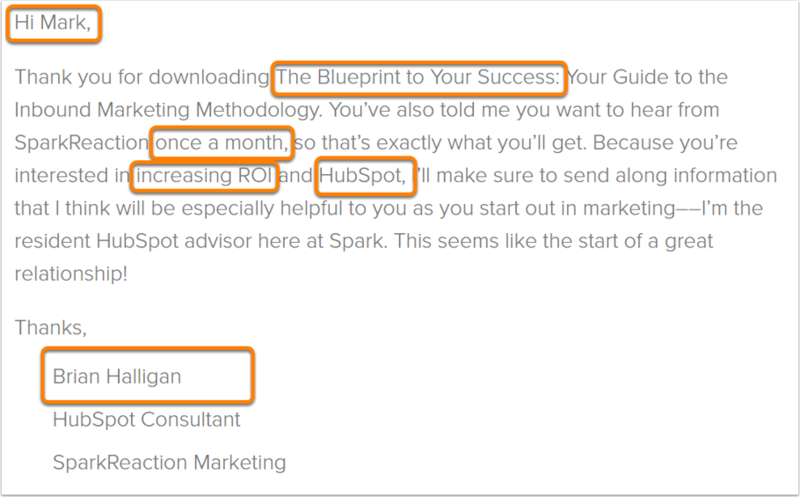 Just consider this example from SparkReaction, a HubSpot Partner, which they shared on their blog. They use the recipient's first name, their most recent download, the requested update frequency, areas of interest and their consultants name to create an email that feels as if it was tailored to that specific contact and nobody else. 2. Add the personalization tokens to your copy: Follow these instructions to personalize your email copy in HubSpot. 3. Pick the default property values and keep: Again, be sure to select default properties and ensure that the information stored in your contact database are correct before using personalization. Not only do segmentation and personalization drive results, they are a more human way to communicate. People like to be talked to as people, not as a number. The above strategies allow your company to send emails that feel more like a conversation, rather than a brand ambassador hooked up to a megaphone. But be deliberate and thoughtful with how you use these strategies. Meghan Anderson, writing on the HubSpot blog, put it well, "Personalization in marketing and content creation requires skill, nuance, and good intention." Keep the experience of your readers top of mind. Treat the information that they've shared with your business with the utmost respect and success will come.